Some people are born into witchcraft; others have magick thrust upon them. So it was with Marlene Vargas and Alex Naranjo, two women who had been making a good living in real estate until the housing bubble popped so calamitously in 2007. 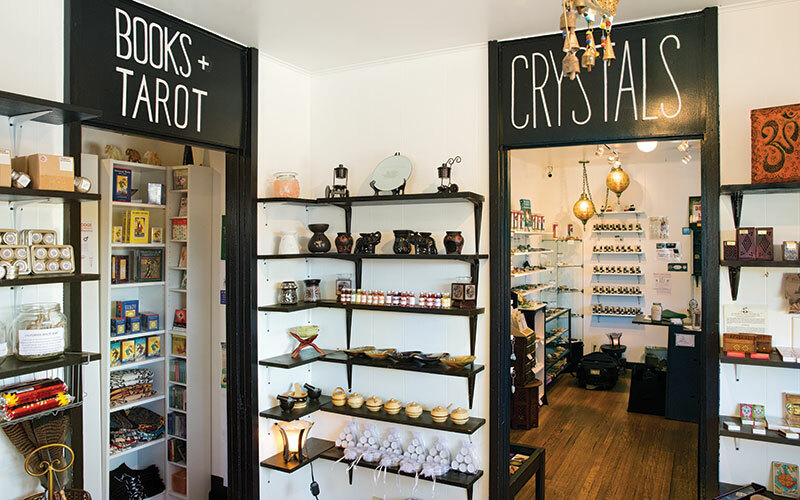 Today the pair possesses a very different kind of hot property—House of Intuition, a minichain of metaphysical stores located in the trendier shopping districts of Echo Park, Melrose Avenue, and Highland Park, where the couple lives. The surprising growth of HOI, whose herb-infused bath salts and scrubs—with soothing names like “Clarity” and “Moonlight”—are carried by Urban Outfitters, began six years ago. It also demonstrates how quickly a niche market can pay off and reflects the startling religious transformations of its founders. “Our lives were very materialistic; they were not spiritual or balanced,” Vargas recalls one afternoon inside a small, dimly lit apartment used for part of her business. The flagship store is perched 21 steep steps uphill from Sunset Boulevard. It’s a bright, airy suite of rooms painted white with black trim, and the wares swing from New Age standards such as crystals and jewelry to more traditional occult favorites like prayer candles and tarot decks (Tarot for Cats, The Housewives Tarot), along with the kind of leather-bound diaries that college students in horror films are always discovering inside secluded cabins. The typical complaints about metaphysical shops—erratic hours, dusty and confusing displays, poor lighting—do not apply to HOI, which is open seven days a week and epitomizes retail’s promise of a clean, well-lighted place. From the street the Melrose store could pass for a bath lotions emporium that also sells scarves, T-shirts, and bundled herbs to be burned like incense. The outdoor signage reads YOUR INTUITION LED YOU HERE. That and, perhaps, a near-five-star approval rating on Yelp. Vargas and Naranjo, a couple in their forties whose voices sound remarkably similar, believe that within HOI’s walls resides a spiritual “entity” that they have no power over. “We are its gatekeepers,” Vargas says. Accordingly that’s the job title given to the stores’ staff, who wear black aprons emblazoned with the business’s tribalistic logo. The gatekeepers sell more than witchy bling and outré conversation pieces. HOI also hosts 65 workshops a month and offers individual consultations with 13 healers and readers. 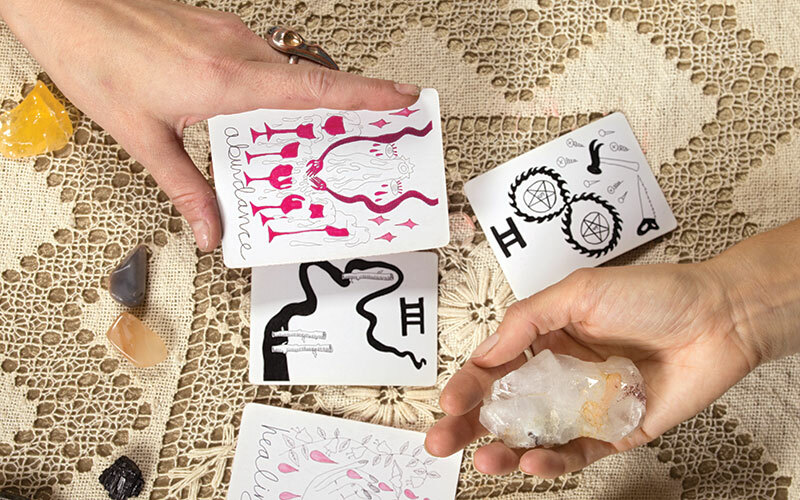 The sessions revolve around tarot card divination, meditation, astrology, and past-life regression, to name a few psychic disciplines. Some of the encounters occur at two other spaces HOI rents—in what they call the Temple of Intuition, down on Sunset Boulevard inside Botanica El Indio’s old space, and in the Temple of Waterloo, a one-bedroom apartment tucked within a tidy 1950s complex behind the store. Nothing about Vargas and Naranjo’s upbringings prepared them for future careers in necromancy. Each was raised in a traditional Catholic household: Vargas, who hated school, attended not Hogwarts but Banning High in the scruffy harbor town of Wilmington, from where, to Vargas’s eye, Los Angeles shimmered like a vaguely ominous mirage. Naranjo had come from Colombia to California as a child with her family and remained here after they returned to their home country when she was 18; she graduated from Glendale High, went to college, and became a social worker. the women would not meet for a decade, and when they did, Vargas says, “It was love at first sight.” They soon moved in together. It was 2007, and Vargas would be in for an unsettling surprise. A couple of years earlier Naranjo had begun assembling DIY altars in her home and firing up herbs on them. “I started to build my own arsenal of things that felt right to me,” she says. But the arsenal and rituals did not feel right to Vargas. Watching her girlfriend, she thought, “You’re burning things; you’re talking to different gods. That’s witchcraft.” And witchcraft was bad. Gradually, though, Vargas’s curiosity won out, and she began participating in the rituals until she was also practicing magic, whose chief ingredient, she says, is the power of “intention”—the clearheaded understanding of why an arrangement with the supernatural is being sought. There’s no getting around the fact that modern witches and their craft suffer from wickedly bad optics. When someone like Vargas says she’s a witch, what’s usually meant is a priest or priestess in an occult order or a practitioner of magic. Most people, however, picture only a pointy black hat, a cauldron, a broom—and a chick up to no good. Mention that you belong to a coven of witches and black-sabbatical tableaux by Goya start spinning in people’s heads. Because of the alchemy of bad PR through literature, religious NIMBYism, and Hollywood, the W word has over the centuries become synonymous with devil worship and malevolence. The reality is that the varieties of occult experience are as numerous as those found in the world’s dominant religions. Threading through them all is a belief in magic, defined a century ago by the British mystic Aleister Crowley as “the Science and Art of causing Change to occur in conformity with Will.” The means can be so-called High Magick, with its rituals and robes, or the more down-to-earth Low Magick—for those seeking immediate gain in the material world, be it money, success, or love. Witchcraft is another form of magic, one whose pagan heart beats to the rhythms of seasonal winds and lunar cycles, and whose adherents genuflect before a goddess such as Hecate, Lilith, or Brigid, or other female deities and demigods. Within necromancy there are as many schisms and quarrels as there are theological debates in Rome, Jerusalem, and Qom. Wicca, which some claim to be America’s fastest-growing religion, is a 20th-century British export and the most widely known magical belief system. In its relatively brief existence, Wicca has splintered into several neopagan “traditions,” including that of the Christo Wiccans, who embrace both Christian and pagan beliefs and iconographies. Over the years Adams has become a mother confessor for many of her customers. “I get very mundane to extreme requests, and sometimes I get mentally disturbed people in here,” she says. Some of those “extreme” requests have involved casting spells to have people killed. “It’s not uncommon,” Adams says. For her, lightening up is the key to success. How HOI went from being just a spiritual detox center to being a spiritual detox center with retail opportunities and more than 4,600 Twitter followers is simple enough. Like Vicky Adams, its owners have no idea how many people in L.A. practice the occult, but they had a hunch that they could generate some money by tapping into whatever was there. So in 2010, Vargas made a withdrawal from her son’s college savings account—“It’s the first time I felt guided to use this money to create a new life for us”—to help the shop get off the ground, learning about sorcery as she and Naranjo went along. It was all very ad hoc. 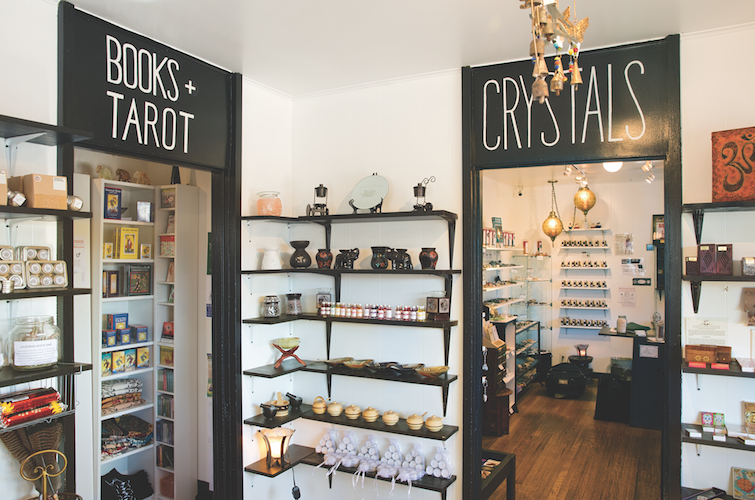 Crystals have been a favorite since the founding of that retail avatar of consciousness-raising, L.A.’s Buddhist-flavored Bodhi Tree Bookstore, which opened in 1970—a year before Panpipes—and was popularized by Shirley MacLaine as a destination for seers, seekers, and celebrities. Declining book sales in the digital age pushed it into the hereafter in 2011, although Bodhi Tree recently announced its imminent reincarnation as an online entity. Shops like HOI may be better insulated because of their eclecticism. After spending $50,000 to rehabilitate the Sunset building, which they painted themselves, Vargas and Naranjo placed an ad on Craigslist for tarot readers and received about 30 responses. House of Intuition was up and running. But for the first eight months hardly anybody bothered climbing those 21 steps. The few who did had a habit of inquiring about crystals, another subject about which the women knew nothing. Then the nervous owners gambled and spent a few thousand dollars on a shipment of crystals—only to let the minerals sit in storage for a month. “I was going to puke,” Naranjo says about the expense. Finally, after Vargas wrote what looked to be their last rent check, she just dumped the crystals onto a table in the store. It proved to be HOI’s salvation when some people dropped in and bought out the rocks. Word spread. That was in August 2010, and ever since, crystals have been HOI’s biggest-selling items. Eventually Vargas and Naranjo found themselves selling other lucrative products they were unfamiliar with, including essential oils and resins. Today a team of six works six days a week to prepare them, along with the store’s signature gold-foil pouches of bath scrubs and other products, in the “potion room” of Vargas and Naranjo’s Highland Park home. One early Thursday evening at the Sunset store, a young gatekeeper named Ryan Trinh works the counter as people arrive for a tarot workshop conducted by Naha, a popular HOI reader and healer. The 28 attendees sign the registry with beatific smiles. All are women. (“There’s definitely a larger number of women who seek spiritual healing and readings,” Jason Miller says of psychic service clients. “It’s something about being outside the patriarchal society that appeals to them.”) Ryan, whose hair rises and then freezes in a sculpted wave, has been with HOI for two years. “I was born and raised here in Echo Park,” he says. Ryan has a day job downtown but may put in as many as 30 hours a week at HOI, which he first encountered as a customer who, suffering a period of “heartbreak and sadness,” became interested in tarot. He believes HOI’s strength is its low-key approach. “We don’t push any agenda or religion,” he says. “People will come in and say, ‘I’m in a crisis, I need help.’ ” That’s when the gatekeepers’ expertise about the store’s crystals, candles, and other magic-spiked inventory is called upon, though they can call a kind of staff hotline for additional information. It’s only fitting that some people seek out House of Intuition during times of crisis. As Vargas says, inspiration for the business “came from a moment of despair and loss.” Along with expanding their Web site, they hope to offer healing and divination workshops via live streaming. They have plans to blow up the brand on social media, too. The women also recently expanded the Melrose Avenue store into an adjoining space, hired a marketer and graphics designer, and are talking about opening outposts on the East Coast. “We are told by our many forms of divination and readings that we will be global one day,” Vargas says with certainty. “We both feel a pull into New York. We feel, intuitively, that Williamsburg will probably be the location.” That portent may have something to do with successful presentations the women made in 2016 to Urban Outfitters in Brooklyn and Manhattan. (Urban Outfitters’ corporate office declined to discuss its relationship with HOI for this story.) “I don’t know how that’s going to play out,” says Vargas. “We set the intention for it, but we’re super scared.” Like so much of HOI’s business, the outcome will be decided by divination. “The entity of the house will determine that,” Vargas adds. The year that so haunts Vargas marked the end of a kind of low magic that had enchanted many in this country into thinking wealth could be conjured almost out of thin air. 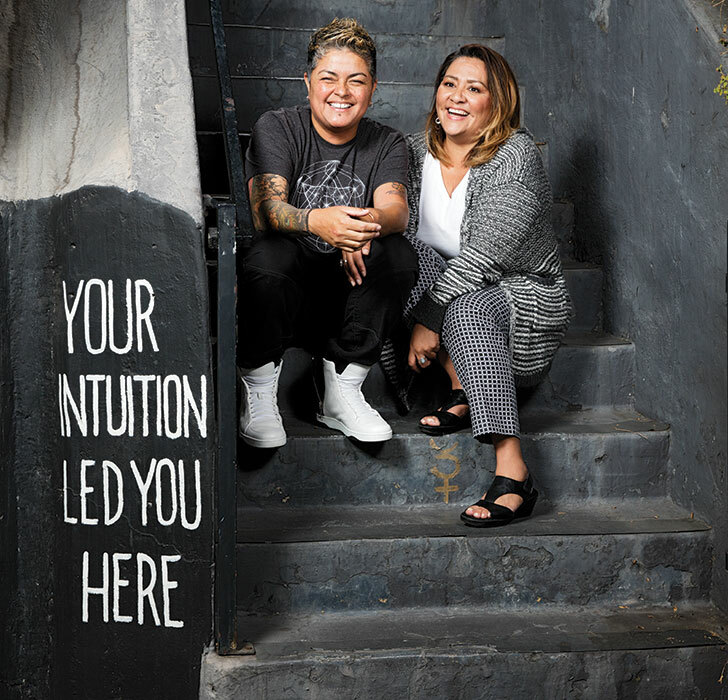 Marlene Vargas and Alex Naranjo found out that the path to their financial and spiritual recovery involved hard physical and psychic work. The women emerged from the wrack and ruin of the American economy as both reluctant witches and successful entrepreneurs—something they marvel at to this day.